Dog sitting, fitness classes, business on the side–what do these items have in common? These are some of the side hustles that Adrienne Dorison did as part of her journey to being debt free. What is even sweeter is that she was working in the corporate world at the time and has since left the corporate world to work her business full-time! How awesome is that? Purely 100% AWESOME, no doubt about that :-). You are most absolutely going to fall in love with this go-getter, high energy, morning person. I’d love to hear from you, what is one time you can remember when not listening to your intuition lead to a bad purchase? Let’s hear it, be sure to share in the comments below! [00:00:27] JH: Hey there it's Jen. I am so excited to have you joining me today from wherever you are listening from, because after all it's really no fun talking to yourself. Granted, currently when I'm recording I'm talking to myself and to my dog, Hershey, but I know you're gonna be listening so it makes it all the better and it's definitely so much better when someone is listening in and getting value about what you're saying. All that to say thank you and I appreciate you being a listener! I've got an awesome, really a spectacular guest today and I can't wait for you to get to meet her. Let me share with you a little bit about Adrienne. Adrienne Dorison is a success strategist and money mentor to go-getter entrepreneurs who are looking to make bigger impacts with their potential, their purpose, and their profits. She recently paid off over $45,000 in debt, in student debt that is, in just six months. And not only that, but she also quit her soul-sucking day job for a life of freedom and purpose. She's also the podcast host of the School of Self-Mastery, and a passion dog mom. So I will definitely be asking her all about how she paid that debt off, and I just really, really can't wait for you to meet her. So let's go get to it. Plus, there's a really cool story about how we connected, so let's go me Adrienne, shall we? 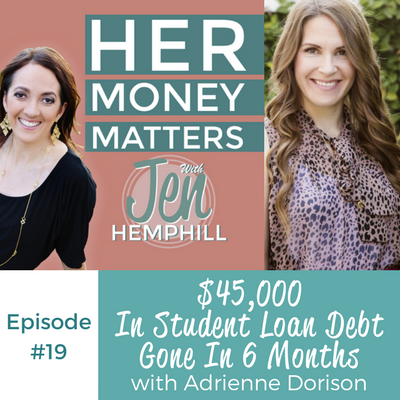 [00:02:23] JH: Welcome Adrienne to the Her Money Matters Podcast. I'm super pumped to have you here! [00:02:29] AD: Thank you! I'm excited to be here. [00:02:31] JH: Well I have to tell you, we just recently connected, but I have to tell you that I'm really loving what you do, what you're about and your Facebook group. I am really, really loving that Facebook group, so if you're listening in and you're in business for yourself, I will definitely put a link to the Facebook group cause it's just really engaged, it's a lot of fun. So you'll have to check that out, so I'll be sure to include that in the show notes. But I have to share with you all how we connected, really quickly, cause it's pretty interesting. It just kind of shows the power of social media. I've been just kind of lurking in the Periscope world, if you're familiar with Periscope. And just kind of lurking, seeing what people are doing cause it's just really interested me and I was on one of Farnoosh's periscope, cause we both know Farnoosh, and she had mentioned Adrienne and how she was doing awesome in Periscope. So of course, naturally, I had to go check her out and see what she was doing because I'm always willing to learn! And here we go! She loves to talk money so I wanted to have her on the show. So again, thank you so much for being here Adrienne. [00:03:46] AD: Thank you! That's a great introduction. I love my Facebook group, it's a really fun space. So thanks for saying that. [00:03:54] JH: Oh no problem! [00:03:55] AD: And the Periscope thing is so funny! [00:04:16] JH: Well naturally, like I said, I was like, "Well who is she? I wanna know! She's obviously doing something awesome on Periscope. Let me learn! Let me go and see what she's doing now." So are you ready to dive in to the questions? [00:04:28] JH: Awesome, awesome. So Adrienne, I know we already know that you're a rockstar entrepreneur. So that is not in question, but I wanna know about you, the person. Obviously you're a dog lover, you have a dog, so I wanna know a little bit more about you on the personal side. [00:05:07] AD: Which is so bad, but I'm sure — I'm not a real parent of a child, but I'm sure parents out there, you guys probably play favorites too and you just can't admit it out loud! But, I have a big Bernese Mountain dog. He's like the love of my life, besides my fiancé! I also have a fiancé now. I just got engaged! [00:05:24] JH: Yay! Congratulations! That is awesome. When's the wedding date? Or have you set one yet? [00:05:35] JH: It takes time! [00:05:36] AD: Yeah we haven't pressured ourselves to set one yet, but we just got engaged at few weeks ago. So it's still weird to say that we're engage. [00:05:42] JH: Oh my gosh! Really congratulations then. That is awesome! [00:05:46] AD: Thank you! And I am a fitness instructor on the side, like I love working out, I'm a triathlete. So that's like really me in a small nutshell. I'm like a go-getter, I'm high energy, morning person [Laughs]. [00:06:06] AD: You might hate that about me, or love it. Right? Yeah so that's like a little bit about me. I don't like to cook. [Laughs] I can cook eggs or like banana pancakes, so that's usually about it. So that's my fiancés role. [00:06:22] JH: He's gonna be doing the cooking? [00:06:24] JH: Oh that's funny. [00:06:29] JH: Hey! It's a partnership. Right? [00:06:54] AD: ...at our local church. And so that's a really big part of my life too. [00:06:59] JH: I didn't know that! That's neat. So I definitely wanna get the scoop on how you paid that $45,000 student debt in six months. But before you tell us about that, I want to know how you grew up around money? So what you grew up hearing, what your parents talked about, tell us a little bit more about that? [00:07:17] AD: So I grew up in a very dysfunctional household. I had an alcoholic, abusive mother who is no longer in my life. [00:07:29] JH: I'm sorry to hear that. [00:07:30] AD: Yeah. It's actually the best thing that probably ever happened to me, just because I think it really made me the person that I am today, for sure. But you know money was never abundant in our home. She was a single mom and we had, you know, obviously my dad but I lived in Florida and the court systems would not allow us to live with my dad for a very long time. And so we lived with my mom and it was not a great place to be, plus there wasn't really a lot of money. And then there was always the complaint from her that my dad should give her money, right? So I think that that happens a lot in like split homes, is that the other person should give you money, that she couldn't make it on her own, like she couldn't make the money that she needed. And so that's kind of some money, probably, stories that got stuck in my head for a very long time for sure. And then my dad was very commission-based and an entrepreneur for a long time and so his money story, how that kind of impacted me was he made very inconsistent income. So becoming an entrepreneur I was like, "Am I gonna be like that?" Right? And so he would make lots of money, and then he would go through periods where he made no money. So it was like always like feast or famine. [00:08:53] AD: Yeah, so I always felt like — I never felt really secure, financially. But he never tried to — so eventually when I was about 12 years old, my biological mom called my dad one day and just said that he could have us and that she didn't want us anymore. And so I ended up living with my dad from then on, so from like 12 years old on and actually never saw my mom again. [00:09:28] JH: Oh I appreciate you sharing that because you're not alone in this. There's others, and that's the reason for this podcast because there's so many different stories, but there's one person or two people that you're completely gonna resonate with, and that's one of the purposes of this podcast. So thank you, thank you for sharing that and being open with that. Now let's talk about your student debt. It took you six months to pay off $45,000. Tell us, how did you do this? [00:09:57] AD: Yes! So this is the number one question I get, right? So the math like doesn't even make sense, and this is why I like to talk about the intensity that you have versus the math even making sense, because you just have to go at it with like really great intensity and momentum. Because when I first started it — so I did go through Dave Ramsey's Financial Peace University class, which I now teach. And I always recommend that course to anyone who is in debt or just really looking to better understand their finances, or things like that. He's a great teacher. And so that was my starting point, and I really had to make a decision to commit to this because I knew I had the debt, I was paying like minimum payments on it for years, and it wasn't going anywhere, right? Like when you make those minimum payments the interest is just growing faster than you can even keep up with at times. So it was like a 24 year repayment plan or something like that. And when I got into this relationship with my now fiancé, he had no debt and I didn't really wanna bring all that into our marriage eventually. And so I needed a plan, and he had been listening to Dave Ramsey for a while so that was kind of like the fire where it started. And we took Dave Ramsey's course together and so I really had to make this like decision. And so that's what I tell everyone, that was the first step was like really making a decision to commit to this, to not getting into any more debt and to taking big action to get rid of it. So lots of sacrifice within those six months to start putting — cause I had a corporate job in the beginning. I no longer have that corporate job because of my own business, but in the beginning I had a corporate job and I had just started the side business, the coaching business that I have now. And so what I was doing was putting all of the corporate income that I could onto the debt, as well as anything that I made in the side business. So it was really about, number one, making the decision. Number two, creating a budget. That was like the biggest thing for me. Creating a budget and the budget system that I used was like a zero-based budget so that you're spending every single dollar intentionally. Or not spending it, but you're putting it in a place, specifically. [00:12:22] JH: Right. Giving it a job. Yep! [00:12:24] AD: Absolutely. So that's what I did, is created a zero-based budget and it was scary at first because I think we avoid our finances a lot. [00:12:33] AD: And so when I pulled out like the, okay three months previous expenses, what was I spending money on? Like I was just nickel-and-diming myself to death for a very long time. You know cause I was making good income at the corporate job, but I wasn't aggressively attacking my debt until I made that decision, and until I created that budget and really saw where my money was going and really telling it, finally where to go. So I finally told my money where to go, so creating that budget, and then cutting some expenses. So I did cut expenses when I created that budget, and it didn't feel super sacrificial the whole six months because like I said, I was sort of nickel-and-diming myself. I was never like a big spender, but it was just like here and there, and those things add up. So just being more conscious, like just being a much more conscious spender and really valuing the things that I was gonna spend money on if I did choose to spend money on them. And that's what I tell people because I think that creating a budget, people are averse to this. Like they don't wanna do it, and they don't wanna be restrictive of themselves, and it's like it's not about being super restrictive, it's just about making really conscious choices. I want people to spend their money, that's why you earn money. Right? [00:13:53] AD: Whether it's now or later, whether you're investing or whether you wanna spend some of it now, but be really conscious of what you choose to spend it on. Do you value those things that you're spending money on? [00:14:05] AD: And I would like ask myself that every time I went to purchase something, and I was like, "No I don't really need this shirt at Target." Right? [00:14:11] AD: Which is what I was doing to myself before, just like here and there. And so I really tightened down on that budget, and then I increased my income. So these were like the main steps, right? Made a full decision to do it, created a budget, cut some expenses in different ways like not lots of eating out, we don't have cable, I switched my phone provider so I could get a cheaper phone provider. And then I started increasing my income because you can only cut so much. [00:14:38] JH: Exactly. And I'm glad you brought that point up cause a lot of people are stuck in, oh the budget constrains them so much. But it's not just about cutting but looking ways, okay how can — you need to bring some income. There's only, like you said, there's only so much you can cut. [00:14:54] JH: So I'm glad that you brought that up that you brought in some more income. [00:14:58] AD: Yeah, and some people, like there are certain things that some people are like, "I'm not going to cut that!" And then I say, "Okay, that's fine. So then what are you gonna do to make that money then? Make it somewhere else. Like you can have that, you just have to find a way to afford it." And so I increased my income first by starting that side business. I had just started my side business, the coaching, and I was working a lot to build that and grow it. I was also teaching fitness classes at the gym because I have a certification to do that. And that's not a ton of extra money, but I was just like, "I'm going for this workout anyways, so why not make money and teach it." Right? [00:15:38] JH: And something is better than nothing! [00:15:39] AD: Exactly! Even if it's like $20 a class, like that's totally fine with me right? Cause I'm gonna go do the class anyways, and I enjoy it. And so I think that's a huge thing, like finding hobbies, finding things you're already doing and figuring out how to monetize them even if it's not like this huge business that you wanna start. Because not everyone wants to start a business, and that's totally okay. And the other thing I did is I was doing dog-sitting, cause like I said, I love dogs and I know that myself, I don't like leaving my dog at like a boarder, like a kennel. I'd much rather leave them with a person that I know and that they're gonna be able to be in their home. And so we have a dog-sitter, and so I started dog-sitting because it was something I loved and I could make pretty good money by just having an extra dog in my house. And once you have one, it's like what's another, right? [Both laugh] And I still do this. Like I still dog-sit, I still teach fitness classes, like I still do these things even though I'm making decent money in my coaching business because I enjoy these things, so why not monetize them too? [00:16:51] AD: For me to sit your dog? [00:16:52] JH: Cause we have dogs — yeah sometimes we need someone to dog-sit. We went, recently we came back from a trip to Spain so it was like a two and a half week trip and we have recently moved here so it's not like we, for two and half weeks to ask that favor of someone or even if you pay it, I was like, "Oh my gosh!" So yes, he was boarded for two and a half weeks and we felt super guilty. But apparently people do it for longer! [00:17:41] JH: I am gonna check that out! [00:17:42] AD: ...with great ratings and stuff in your area. Yeah, so that's a good resource for people whether or not they wanna have their dogs be watched or if they wanna be a dog-sitter. [00:17:51] JH: Yeah I'll definitely put it in the show notes cause you just never know! You never know! So awesome. Well thanks for sharing that story, and so it was just basically about conscious spending, and increasing your income and obviously making that decision, first and foremost, is how you basically got rid of $45,000 of debt in six months! [00:18:14] AD: Yeah. And it's like, you know, I'm totally transparent on my numbers because I think people just still see that and they're like, "That's crazy unrealistic!" Right? So I kind of cleaned out my savings, cause I was holding on to like $5,000 in my savings in the beginning of it just because I think that's kind of what people do. They're like, "I know I have all these debts, but I can't get rid of these savings." And so I cleaned it out down to $1,000. So I have $1,000 emergency fund, just like Dave teaches, and so I started out by just like pouring that $4,000 on and then everything I made that wasn't going to like my bare minimum expenses, like my food, my shelter, my like keep my phone on, and my electricity. Those were the things I was paying for, very few additional things. Right? So getting that grocery bill down, not eating out. Like we would eat out maybe once a week, or actually maybe it was even less at that time. But my fiancé, like everyone asked me, "Oh, but he was helping you too?" I was like, "No, he didn't financially help me at all during this, but he emotionally supported me." [00:19:24] AD: But I just wanna make it clear to people like this was my income, so that it seems more realistic. This was just me, but I was paying about $8,000 a month — if you workout the math — from my combined corporate plus the money I was making in all those other endeavors, whether it was coaching, business coaching, teaching fitness, or dog-sitting. So all of those things, and things like a tax-refund. Oh I also sold stuff, I sold a set of furniture, so I was just like doing anything I could to make as much money as I could. [00:19:58] JH: And you did it, and congratulations! Cause student loans, they kill me in a sense. We recently also paid off — it was on target for the end of the year and we did it several months ago. So it's a great, great feeling. Yeah the student loans killed me as far as — cause you said, it was a 20 something year term. That's almost like a 30 year mortgage. You know when mortgages are, depending on where you live, a 100, 200, $300,000 they're financed over 30 years. So yes, that is just crazy. It's just crazy to fathom those numbers for student loans. [00:20:38] AD: It is. And it's a whole generation of people that are like stuck there, so you can get rid of this! Like do it as quickly as you can. Don't look — cause I saw something about them trying to extend the plans for even longer and it's like, but think about it. That doesn't mean you're paying any less, it means you're paying more, you just have to pay less per month. [00:20:57] JH: Exactly. They're gonna get the money somewhere! [Laughs] Somehow. So now, you know you've achieved this, which is awesome and congratulations again. And now the beautiful thing is you have that extra money that you were like making more and you're just hustling to make sure that you got the debt. And you have that money to do as you please and make sure that it makes it work for you. Whether investing, whether putting it in your business, and that's just beautiful cause it's a beautiful feeling for that freedom that you have. [00:21:31] AD: Absolutely. It was really surreal at first. [00:21:35] JH: Yes! Yes, yes. Well that's awesome. And tell me, what would you say is the best money advice you've received? [00:21:42] AD: For me it's "Don't spend more than you make". I think that a lot of people just use credit and think they can afford the payment, but they can't actually afford the thing. And so we have this like society of instant gratification, and I just advise people and I think that's the best advice for me that's really changed my life and allowed me to be debt-free, is "don't spend more than you make". Like it's a really simple philosophy, but if you don't follow that philosophy, you'll never be wealthy. [00:22:18] JH: Right! And a lot of what people fall under, that I see, and I see with you teaching you see it too, is that yes they spend more than they make but they don't even know what they're spending. So they're not even clear as to what they're spending, what it looks like in comparison to what they're making. [00:22:38] JH: And that's a huge, because they are fearful of knowing those numbers, but like I tell them, you've got to start somewhere. You've gotta know where you're at to get to where you wanna go. [00:22:49] AD: Yeah you have to look at it. [00:22:50] JH: You have to, you have to. As scary as it may be, but you have to. It's just numbers! They're not coming out to get you. For sure. And what would you say you do well with money? [00:23:59] JH: Right. And that's how I've been and my husband he's the "spender". Even though I fall into that cause sometimes I go on these binges for that. But it's good. He's been able, and you'll see, that he's been able to balance me out. It brings a point where you enjoy your money more instead of just get stuck on the saving. Which I know, and I know you will, and I know you are. [00:24:41] JH: Right, right. Cause you can't take it when you're gone, so you gotta enjoy life for sure. And of course, we know you're a Dave Ramsey student and you teach the Financial Peace University, so the next question; do you prefer to use cash, cheque, or credit? [00:25:05] AD: Yeah, I'm a Dave Ramsey fan, and that's a good habit to build. Or it was something that helped me during my debt repayment, was to use Dave's cash system. I will say that I don't use cash all the time anymore, now that I'm out of debt just cause it's a little inconvenient. But for that time in my life, and for some things I still like to just have the cash and use the envelope system. But for me there's — it helped me reconnect by using physical cash, not just my debit card, like I don't have any credit cards and I use my cheque book only for our house cleaner. [Laughs] That's the only time I write a cheque. And I just realized that now! [00:25:51] AD: But I liked the emotional attachment to the cash that I had when I would go to maybe buy something, you know we used it mainly for groceries or things like clothes when I was doing my debt repayment. And if anyone out there is trying to repay debt and anything like that, I know it's not as convenient nowadays to use cash cause you have to go and get it and all of that, but you will find that you don't spend as much and this is a proven statistic when you use cash versus when you use a card, even if it's a debit card. Like you're still swiping and there's no emotional attachment there so you're just gonna spend more. So it was really helpful for me to have to like — you won't part with that cash as easily. So I'm a cash queen! [00:26:33] JH: Awesome, awesome. And of course now we know you're going to be married, and so how are your personal finances managed now? You've managed your own, but how would you see, what do you think is gonna happen when you get married? Or have you all talked about that? Who's gonna manage? Is one gonna be a bill payer? Are you gonna both divvy it up some how? Tell us about that. [00:26:56] AD: So that's a good question. For when we get married, we haven't like fully talked about like who's gonna manage things, but just from our relationship now, I know that we'll have a joint account, I like knowing that what's ours is ours no matter who's making it. And I think that's important especially that I am the main breadwinner and I think that's important for him to know that it's his money too. [00:27:52] JH: Well that's why there's, again, that's why there's a partnership so you can divvy these things up. [00:27:59] AD: I'm good at paying my own bills now, but it's not something I enjoy doing. I'm not sure if he enjoys doing it either, but he's much more on top of it, I would say, than I am. [00:28:09] JH: Okay. Perfect, perfect. [00:28:10] AD: I'll help make decisions. [00:28:13] JH: Awesome. And what would you say is your proudest money moment? [00:28:21] AD: Yeah, so my proudest money moment would be when I paid off that debt. When I was able to like really sent in that final payment, the final payment was about I think $8,000 and something dollars and I sent in that final payment, and I looked into the account and I was like, "It's done!" Like I actually didn't tell anyone for like a few days cause I wanted to make sure it cleared and everything. Cause I honestly like wiped myself clean. As soon as I had enough money to pay that thing off, I wiped my accounts clean. Like I maybe had a few hundred dollars left in there for the rest of the month, which I was totally okay with cause I just wanted it gone. [00:29:03] AD: But it was a tough month after that. And everyone's like, "Well you're debt-free now!" I'm like, "Yeah, but I don't have any money." [00:29:10] JH: [Laughs] Yeah and the craziest thing is that the people you were paying this student loan to or that were financing your loan, they didn't throw you a party. They're just like, "Okay, thank you." It's funny how they, for anything, they don't like "Woo-hoo, yes, congratulations!" It's just like, "Okay, thank you. Carry on, move on." [00:29:32] AD: Right it was like, "Thank you for your payment." Like it wasn't even like, I didn't even get a letter saying that it was done! [00:29:37] JH: Right! At least send a card, a congratulations card. That's what I say. Customer service, come on now! Up your game. [00:29:45] AD: And they always told me when I didn't pay! [00:29:47] JH: Right! Right. I know right, it's crazy. Crazy, crazy. So I know we all have this, and tell us what would you say is your worst purchase or your worst money spent? [00:29:59] AD: So my worst purchase, there's probably so many over the years, you know? But I'll just probably have to use a recent one where I knew that it maybe wasn't the best purchase for me. It was for coaching, training, and I'm a business coach myself and I had heard from other people or seen online that this particular coach was amazing and blah, blah, blah. And I had spoken with her, and I knew it wasn't a good fit, like I just kind of knew that we didn't connect as well as I should have. And so for me it was only the worst purchase because I didn't listen to my intuition. Like whenever your gut tells you, "This isn't the best choice for you." Even though other people tell you it's a great choice, you should listen to that and you should really listen to that gut instinct, that intuition within you and whether it's to purchase something or to not purchase something. Right? So at that point I should've listened and not purchased, but there's also been decisions where I didn't purchase something where my gut told me I should, and I was like beating myself up later. Like, "Ah, should've bought that!" You know? [00:31:19] JH: No and you bring up a good point, for sure. Because as women we've got great intuition so we just need to listen to it for sure. [00:31:42] JH: That's great, that's great. And who would you say influenced you the most in the area of money? [00:31:48] AD: So personally, my fiancé. I can say Dave Ramsey cause he kind of taught me everything and really gave me that hope and belief, but my fiancé really got me on this boat. Like he showed me through his actions how to really be good with money, that it was possible for me. And he believed in me the entire time. [00:32:16] JH: I hope he's listening! [00:32:20] JH: That is beautiful. Well I can tell that he's gonna be a great partner in your life for sure. [00:32:25] AD: Yes, we're excited. [00:32:27] JH: That is awesome. Now Adrienne, I know you know this podcast is all about just making money simple and taking control of it. So how would you finish this sentence? Her money matters because ____? [00:32:40] AD: Because it's her money! [00:32:46] JH: Good! I like it, I like it. Well thank you, that concludes our interview Adrienne. Thank you so much for being here, but tell us where is the best place for people to find you and learn more about you? [00:32:58] AD: Yeah so there's a bunch of places, but I'm a fellow podcaster and that's probably who listens to your podcast, it's people who like podcasts. So my podcast is called "The School of Self-Mastery". You can search it in iTunes and Stitcher and find it there. And my website's just AdrienneDorison.com. [00:33:17] JH: Perfect. And I'll be sure to include links to those two things in the show notes. So again, thank you Adrienne. It's been a pleasure, it's been fun talking to you today. And I will talk to you again soon. [00:33:31] AD: Thank you Jen, it was awesome! [00:33:32] JH: Okay, thank you. [00:33:35] JH: Didn't I tell you that she was spectacular and just absolutely fabulous. I hope that you enjoyed it as much as I enjoyed chatting with Adrienne. There's really certain people that you feel connected, you know that feeling, on so many levels. And Adrienne is just that one of those people for me, that we really, truly connect on those levels especially her philosophy on money and all those things are just so in alignment with how I feel and how I do things. So it was just awesome. One takeaway/reminder that she had mentioned was about listening to our intuition. As I mentioned when we were chatting was that as women we're just naturally just built to have a great intuition. But whether we listen to it is really another story. And I think a big part of that is that when it comes to money it's just feeling overwhelmed. And that overwhelm tends to fog up our vision and doesn't really allow us to see things for what they are. And nine times out of 10, this comes from just not having that clarity around our finances. One way to clear up that fog is just really by grabbing that "Jump Start Your Money" mini-guide that I have made for you as my free gift to you. It will help you get that clarity, it will help you take the action that you need without the overwhelm, so you can finally use that intuition that you have that's just being covered up, so you can make some great financial decisions. It's super easy to grab the mini-guide. Just text the word "miniguide" to 33444. Of course, please don't do this when you're driving or operating a vehicle. Again you can text the word "miniguide" to 33444. So that is wrap for today. I really wanna thank Adrienne for being with us and being so transparent and sharing such a great story. Be sure to just check out those show notes to find out where to find Adrienne and the different links. I'm also gonna include the links for those of you that are looking for dog-sitters, or possibly looking to be a dog-sitter just to ask some more income to your finances. So I'll include those, where to find Adrienne and so forth. So you can find that at JenHemphill.com/19 — as in episode 19. That is JenHemphill.com/19. And don't forget to text the word "miniguide" to 33444 just to grab your Jump Start Your Money" mini-guide.